While network owners are migrating to 40G & 100G infrastructures, most tools available today cannot ingest high-speed traffic. They lack both the physical interfaces and processing power to do so. 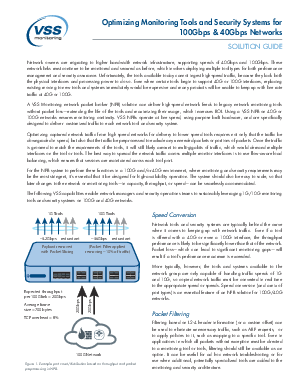 A VSS Monitoring network packet broker solution can deliver high-speed network feeds to legacy network monitoring tools without packet loss, maximizing the useful life of the tools & increasing their ROI. In this brief, you'll learn how essential capabilities such as Speed Conversion, Packet Filtering, Packet Slicing, (Heterogeneous) Port Density, Flow Aware Load Balancing, High-Availability Backplane, and High-throughput System Interconnect will optimize network monitoring & security deployments & simplify network upgrades.